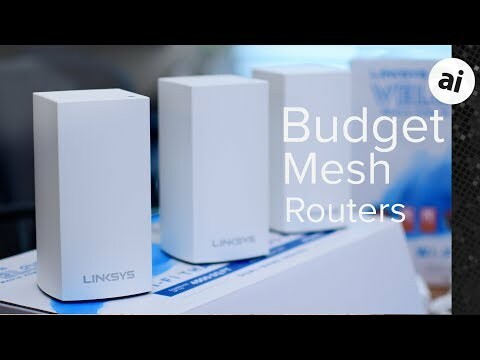 Belkin-owned Linksys just launched an updated, more affordable version of their popular Velop mesh routers. Aside from being extremely capable routers on their own, Velop is the first non-Apple router to be sold in Apple Stores, lending to their credibility. When we reviewed the original Velop setup, the biggest concern was the high price tag associated with it. Linksys has gone a long way to alleviate that concern with the new entry-level model. Like the larger one, it is available solo, or in multi-unit packs. Each individual node is just under six inches tall, and very reminiscent of Apple's discontinued AirPort routers, just in a more modern, squared off design. On top, alongside a series of small circular vents, is a status LED that assists in the setup process, and is a quick way to discern the status of each node at a glance. After setup, a blue light signals it is connected to the internet, red means no internet access, blinking red means out of range, and yellow designates weak connection. The power switch and a reset button are located on the underside, and shouldn't need to be accessed often. Both Ethernet ports and the power input are located around the back. Only having one LAN port is limiting, almost mandating a standalone Gigabit Ethernet switch for anything beyond the most basic wired network setups. In the box, Linksys includes a single Ethernet cable, necessary for connecting the first node to the modem. All of the remaining nodes can also be hardwired, though you will have to provide your own cables if you opt to go that route. In most setups, users will opt to keep the other nodes wireless. Each node must be set up one at a time, starting with the primary node plugged into the modem. During setup, the Velop app walks you through the process, first asking if a modem and router or a single modem/router combo is being used. It will then ask you to plug each node in, it will check its location, run an update process, and move on. Linksys helps you a bit in placing the nodes by giving you a rough idea of where to put them, and alerting you if the signal strength suggests that the placement is too far away. Overall, we enjoyed the Linksys app, though not as much as the one that accompanies the Eero routers. Linksys uses the same app for setting up all their routers, not just the Velop series. This meant whenever we searched our phones for the "Velop" app, it didn't show up until we searched for "Linksys" instead. Small thing, but something we kept doing. Right when you launch the app, it shows the internet status, as well as the number of devices connected to the network. There is quick access to many settings such as enabling guest access, parental controls, and device prioritization. Within the app, there are sections to run a speed test, access Wi-Fi settings, view all connected devices, enable notifications if Internet access ever disappears, and to tinker with the more advanced Velop settings. One thing we noticed that was odd was the ability to turn off DHCP for the router and essentially put it into bridge mode was absent. This is something we see with a lot of mesh routers, but it was possible to assign a static IP to the WAN side of the network. Parental controls allow the administrator to create schedules that pause Internet access and block specific websites for any device connected to the network. It is pretty basic, but can still be handy for families. Device prioritization is one of our favorite features for the modern home network, which can help in prioritizing devices used for streaming or playing games. You are limited to three devices to prioritize, which was enough for our testing -- and should be enough for most setups. We used both the new AC3900 and the larger AC6600 for a while now in a variety of scenarios in two different locations. In both a smaller 1,500 square foot townhome and a larger 4,000 square foot two-story house, signal strength was strong. With the townhome being in a very crowded apartment complex, we noticed no difference in speeds with all of the congestions of countless other wireless networks in close proximity. This is something that can be problematic for other routers -- including the dearly departed AirPort Extreme or Time Capsule. We noticed no dramatic network slowdowns, and fairly impressive speeds as well. Speeds were slightly slower on the smaller AC3900 routers, which is to be expected. Our testing environment was set up with gigabit internet, far faster than the wireless performance could handle, so that was not the limiting factor in our tests. On the AC6600 router, we averaged around 366 Mbps down and 190 Mbps up. In the same environments, the AC3900 was pulling 205 Mbps down and 186 up. Both routers were able to outperform their rated specs. This new model, the AC3900, is a slightly smaller, slower, and more cost-effective variant of the AC6600. When compared, Linksys says the AC3900 is provisioned for internet speeds up to 100 Mbps, whereas the AC6600 can handle up to 300 Mbps. Larger homes also benefit from slightly more coverage on the AC6600. The newer AC3900 is also only dual-band (one 2.4 GHz and one 5 GHz), where the AC6600 is tri-band (one 2.4 GHz and two 5 GHz). This is what Linksys really sells the difference on, so it is important to know what benefits three bands can offer. Physically, there are also a couple differences. The new AC3900 is a bit smaller in stature compared to their tri-band brethren. Linksys also moved the ports from the underside, to the rear of the unit, eliminating the built-in cable management at the same time. Otherwise, there is still the same pair of Ethernet ports and the power port. Historically, tri-band routers are quite a bit more expensive. So it is important to be sure they are needed before taking the plunge. Users who have a whole lot of 5 GHz devices will notice the biggest difference on tri-band. Simplistically, having a second 5 GHz network is like adding an extra lane to the highway. More devices can hop on the network and be less likely to negatively impact Wi-Fi speeds. Those with a much larger home, fast internet above 100 Mbps, or lots of 5 GHz devices should opt for the larger AC6600 setup. Those with slightly smaller homes, fewer devices, or internet below 100 Mbps, which is realistically most of the United States, will do just fine with the more affordable AC3900. There are now many options for those interested in Velop routers, and things to consider when choosing between them. There are two different models, and then one, two, or three packs of each of them. Unless you have a home above 4,500 square feet, have internet faster than 100Mbps, or a large number of 5 GHz devices, the more affordable AC3900 will suit for less dough. Speeds were solid, signal was great, and setup is relatively painless with either option. Compared to the rest of the market, the price is a still a bit on the high end, but the quality is definitely there to help justify the cost. When it comes to speed, if this is your ultimate goal, there are other standalone routers that can best either model of the Velop system, but they may not offer the expandability and coverage we see here. Amazon has both versions of the Velop routers available with the tri-band three pack running $497.97, and the dual-band three pack running only $299.99. Single and two-packs are also available. B&H also has the tri-band Velop system for $499.99, and Best Buy has the new dual-band models for $299.99. For other options, be sure to check out our roundup of great AirPort router alternatives which includes several mesh systems and individual routers. I've been keeping my eye open for a replacements. I have two Airport Extreme units that I use in bridge mode as AP's. Unfortunately not having a bridge mode makes these units a non-starter. I use a very secure router in front of my cable mode. In order to be able to provide the max security it needs to assign the IP address. I can provide the router with a device mac address and have it assign a specific IP address, thus simulating a static address. The impression I get is that this will not work on these units. Am I the only one here who continues to use Apple's AirPort Extreme and find it meets all of my needs? A USB port for an external drive would have been good. No I'm pleased with both mine, and intend to use them until forced to replace. Since its now a "legacy" device abandon by its manufacture the thought does go through my mind "when the time comes would this be a suitable replacement?". Many things may happen overtime. Un patched security flaws, new standards/features added to wi-fi etc.... Eventually they will have to go. No you aren’t. My 2tb time capsule continues to meet my needs as well. This is exactly what you should be doing...use it until its no longer useful to you and then go use something else. It does look to have a bridge mode, though I didn't test it. You can see it briefly in the review video when I am demoing the app. How well does it pass off control from one device to another as you move between rooms? When I used multiple WiFi routers in the past I had two choices: either name them with the same SSID or different. If I used the same, the device (a WiFi iPad) stayed connected to the WiFi coming from the room I had just left and never connected to WiFi router in that room (unless I disconnected and reconnected via settings). So, I found it easier to give each a different SSID such as "kitchen" or "Main" and, again, use settings to specify which router I wanted to use. So, do these disconnect from the weaker signal and reconnect to the stronger signal as you move between rooms with you doing anything? A concern I would have is security: I use Mac address to identify each device connecting to my router. If the router does not recognize the MAC address, it will not permit it to connect. Do these provide that security feature? The router-jump with the same SSID should automatically happen (and does with the Velop) when signal strength drops below a certain threshold that the manufacturer determines. Why it's not doing that in your case, I really don't know -- that's not a normal behavior. I'll send your second question to Andrew -- but I'm 99% certain that it allows MAC filtering. Edit -- yes, it does allow MAC filtering. Absolutely not. You can see others here are doing the same thing. Using it until it dies, or you require an upgrade is a great thing to do! Reduces unnecessary waste and you get your money's worth! There are downsides to Apple's router though, which is causing a lot of people to upgrade. Some people were still on the pre-802.11ac AirPort Extreme, so they had been waiting for an Apple upgrade before they upgraded. Many others wanted tri-band routers instead of dual-band. Apple didn't offer this, while many others did. Mesh networking is also taking off. It offers much better coverage in large or older homes and offers better speeds. Even when connecting two AirPorts together, you lose a bit of speed. Using a mesh router gets you no discernable drop in speed regardless of which node you are connected to. So if Apple's router is working great, perfect! but for many others, they had hoped to see something new from Apple and looking for other options for some of the above reasons. Hey George, sorry that that area wasn't clear in the review. I had literally no issues jumping between nodes. I would go across my home, up the stairs and never notice the signal drop at all below full bars, and nary a hiccup in connection. I'm sure this can change based on the home and how many nodes are being tested, but it went very smooth for me. Much smoother than trying to use two routers with the same SSID. I have an AP Express (the flat one, don’t know which gen) hooked up through Ethernet to a router and spawning a 2.4 and 5 GHz network. It is located in my living and my ATV is connected to it wirelessly. On the same floor, some room further down I have an office and use a (flat as well) TC in bridge mode and as my primary backup device for the gear standing there. All connected wirelessly through the 5 GHz network. In addition, i have one small square AP Express downstairs in bridge mode as well to spread the signal there. This gives me good coverage all over, and I never - at least consciously - experienced issues walking with one iPad or phone from one area of the home to another. sometimes (maybe once a month) my TC gets funny and looses for some unknown reason the network connection indicated by the Amber light. A restart is fixing this. Other than that no complaints. But also no idea what - if - a mesh system would offer in addition. Apart from cluelessness how to replace my backup solution using TM. Also,I like how it’s unobstrusive and doesn’t need to be hidden in a cupboard. I really Don’t see the need to change now. I guess I will use the gear until it dies and then see what’s on the market. I’m just curious what I’ll do if just one of my devices let’s me down for good. Timely article. I ordered it from Amazon and will know this week how well it works out. I have a Netgear R6300 v2 "smart" router and have been quite disappointed with the Wifi range of their so-called "beam forming" technology. It got exceptionally worse with the latest firmware update that was required to patch a security hole.